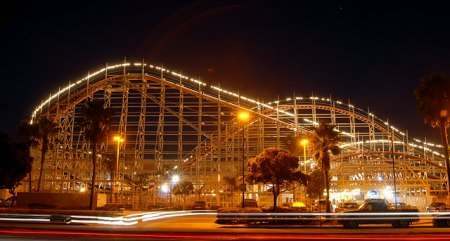 Come enjoy a day at Mission Beach CA in San Diego, ride the Belmont Park Giant Dipper rollercoaster, and picnic in nearby Mission Bay Park. Mission Beach California is a beachfront playground with a nice sandy beach bordered by a long seawall and cement boardwalk. We love the variety of things to do, especially for teenagers and young adults at Mission Beach. 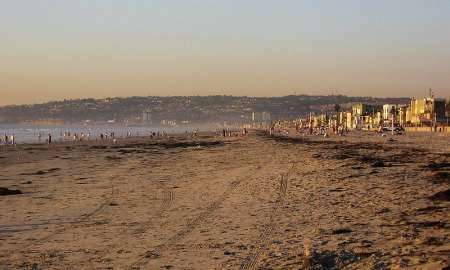 Vacations here are popular with tourists, and also locals love to visit Mission Beach in San Diego. In the water you will find lots of people swimming, surfing, or playing in the waves. On the sand you will find people playing volleyball, building sandcastles, or socializing. On the Mission Beach boardwalk people are rollerblading, skateboarding, and biking in San Diego. There are many shops nearby to rent equipment. At Mission Beach in San Diego CA you will find places to eat and shop right along the boardwalk. Check out The Beachcomber bar at the south end, or enjoy a simple ice cream cone on the boardwalk. 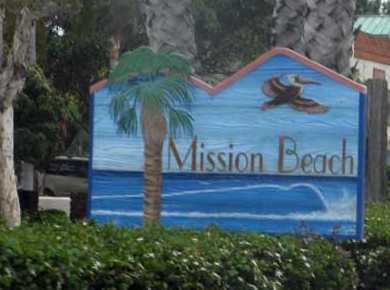 There are a lot of Mission Beach California vacation rentals at South Mission Beach San Diego, and along the long strip of beach north of the Belmont Park area. At the north end the beach extends into Pacific Beach. Parking: Large free parking lots off of Mission Blvd. at north and south side of Belmont Park, and at the foot of West Mission Bay Drive. Additional parking in two lots across the street adjacent to Bonita Cove. Getting There: Short walk to the beach from parking areas, or from Mission Bay Park. Also the long Mission Beach boardwalk stretches from Mission Beach to Pacific Beach and offers great access by bicycling, roller blading, and jogging. Things to Do: Walking, jogging, roller blading, sunbathing, sailing, swimming, bodyboarding, surfing, beach fires in firepits, rides and rollercoaster, wave house, SeaWorld, shopping. Things to See: Young people at the beach, sunset over the Pacific Ocean, Belmont Park, Wave House, Seaworld. 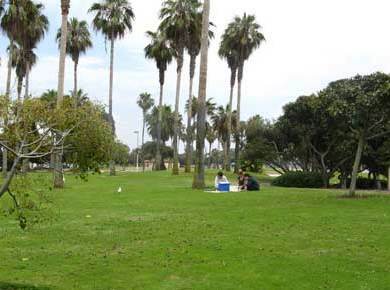 Facilities: Restrooms (near Ventura Place and south of Belmont Park), showers, changing rooms, trash cans, concrete Mission Beach boardwalk along the beach. Services: Many restaurants, bars, surf shops, rental shops and hotels along the beach. High Tide Access: Good access to this deep, wide beach. Lifeguard: Lifeguards during summer at multiple locations, year around at main Lifeguard station at Ventura Place near Belmont Park. Things NOT to Do: No alcohol, no glass containers, no smoking, no littering, no disturbing noise, no overnight sleeping, camping or parking. Across the street from Belmont Park Mission Beach is the edge of Mission Bay Park, where we like to picnic on the grass under a shady tree. At Mission Beach in San Diego, dogs are not allowed during the day, but you can enjoy a walk or run along the beach with your dog in the morning or evening. Leashed dogs are allowed before 9:00 AM or after 6:00 PM (after 4:00 PM between Nov. 1 – Mar. 31). Driving Directions to Mission Beach California - From Interstate 5 in San Diego, take the Grand Avenue exit and go west. Turn left on Mission Blvd. Park in the free public parking lots at the north and south side of Belmont Park in Mission Beach San Diego, or at the end of West Mission Bay Drive. Directions to Mission Beach from Pacific Beach: From Pacific Beach, you can walk, roller blade, skateboard or bike ride along the cement boardwalk that goes from Pacific Beach to Mission Beach. Some beaches are best explored at low tide. Check out the tides and find maps and directions to the popular beaches below. What are San Diego Tides?